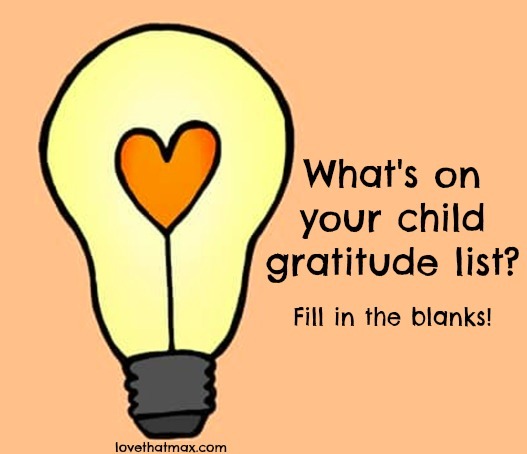 Love That Max : What's on your child gratitude list? When Max was a little guy and I'd get anxious about his development, as parents of kids with disabilities tend to do, I used to jot down stuff about him for which I was grateful—what was uniquely awesome about him, stuff he enjoyed, progress he'd made. It helped shift my brain out of worrying about the future, if only for a while. Here's my short list these days, plus a blank one to cut and paste into the comments section and share your responses, if you'd like. I never imagined that someday he'd... Have complete conversations with me. One of the most memorable things he's ever said/communicated is: The first time he said my name, "Ohmmy." One thing he does that always makes me smile is: When his little bro is acting naughty, Max will lean over to him so they're at eye level and say "No, Ben!"